This is the chemistry set of today. Those semi-dangerous labs-in-a-box are a thing of the past. Nowadays, they aren’t going to pack anything remotely dangerous into those learning kits, so you might as well look elsewhere for real fun. Since Junior no longer has the capability to produce searing acid baths for his action figures, the modern chemistry set might as well produce something useful: food! The Molecular Gastronomy Starter Set contains an assortment of chemicals and equipment to inspire the budding science-minded chef. 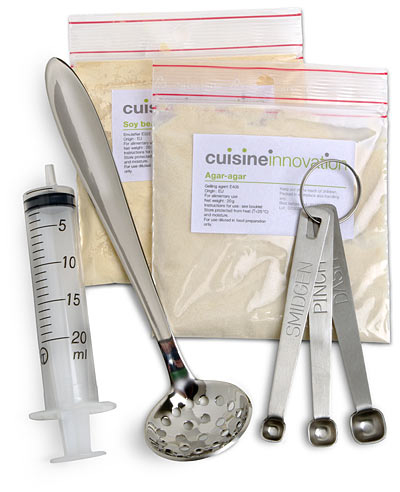 From flavors suspended in foam to ingredients tortured into the shape of caviar, the chemicals supplied in this kit will inspire seasoned chefs and newcomers alike. Makes a perfect gift for those that have moved on from the baking soda volcano scene.